Seats are limited. Please register here as soon as possible. 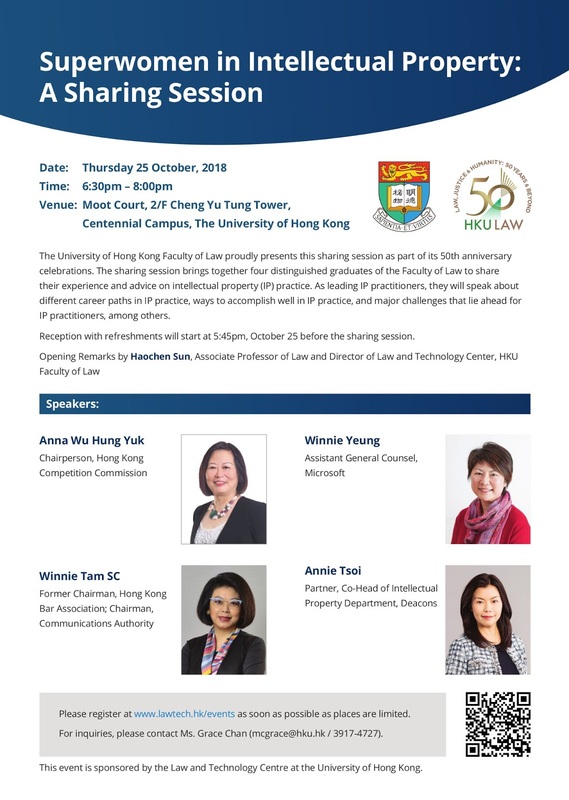 The University of Hong Kong Faculty of Law proudly presents this sharing session as part of its 50th anniversary celebrations. The sharing session brings together four distinguished graduates of the Faculty of Law to share their experience and advice on intellectual property (IP) practice. As leading IP practitioners, they will speak about different career paths in IP practice, ways to accomplish well in IP practice, and major challenges that lie ahead for IP practitioners, among others. Reception with refreshments will start at 5:45pm, October 25 before the sharing session. We are in the progress of applying to the Law Society of Hong Kong for 1.5 CPD points for this talk. We will contact you once CPD accreditation is finalized. For enquiries, please contact LTC Centre Secretary Ms Grace Chan at mcgrace@hku.hk.